An avalanche in north-west Pakistan has killed at least 24 people who were digging for gemstones, officials say. Police said it took two days for locals to bring them news of Tuesday's deaths in remote Kohistan district. Kohistan is about 350km (210 miles) north-east of Peshawar and is close to the region that was hit by a devastating earthquake in October. Police say a military helicopter has begun ferrying bodies of the dead back to Dassu, the main town in the area. Local police chief Ashfaq Ahmed said 12 bodies had so far been airlifted back and handed over to relatives for burial. "There were around 120 people extracting gemstones when the avalanche struck, burying a number of them," he told the AFP news agency. "Twenty-four were killed and the rest are fine. 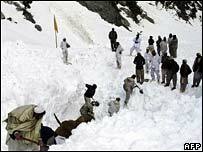 Locals have dug all the bodies out of the snow." More than 73,000 people were killed in the October earthquake which left at least three million people homeless, according to officials in Pakistan. Police officer Azhar Nawaz told Reuters the Kohistan area had been "hit by several aftershocks in the past week and there was one on the day of the avalanche". The area where the avalanche occurred is several days trek from Dassu and rich in precious stones which lure prospectors. "This is a good source of income for many people in the region where there is no industry and very little agriculture," local official Niaz Mohammad said.